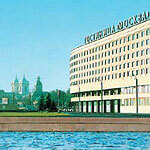 Opposite Alexander Nevsky Lavra on the corner of the Nevsky Prospekt in view of the river Neva the modern and comfortable Hotel Moscow has taken its place. The favourable location in the historical and architectural centre of the city close to the metro station "Alexsander Nevsky Square" is perfect for such type of hotels and gives the Hotel Moscow a solid advantage compared to other St.Petersburg hotels. The unique and unforgettable view of the city will remain in your memory forever. Excellent service provides you with all the necessary support for your business. With comfortable cozy rooms, convention and leisure facilities, restaurants and bars the Hotel Moscow has every thing you need for a successful business trip. 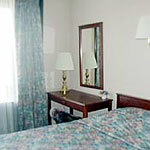 The hotel has 125 singles, 560 doubles, 40 two-room suites, and 10 three-room suites. One side of the hotel faces the Neva River while the other overlooks the Nevsky Prospect and the views of the city and river are spectacular. All the rooms are equipped with electronic code locking systems of the German company "Messerschmitt" operated by the computer. the Hotel is equipped with security TV. Prices start at $76 per person. 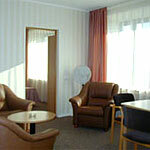 Offices and rooms for negotiations be rented, modem facilities for international communications and other. Underwater massage, turkish bath-house, swimming pool, massage, solarium, fitness. Open 1.00 p.m. - 7.00 a.m.
We can offer: cutting, styling, cocktail, party and wedding hairstyles, european and classic manicure, increasing nails. Open 9.00 a.m. - 8.00 p.m. 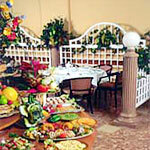 There are 2 restaurants, 2 banquet halls and 6 bars in the Hotel. If you seek solitude for a calm talk the bars located on every storey of the Hotel are the suitable place for you. The restaurant "Monplaisir" arranged in the style of a "french terrace" with luxurious buffet dinners is the fine place to meet your friends and business partners. Restaurant "Salt and Pepper". Stylish surroundings and quiet will create a cozy and unchattered atmosfere. Blini bar. Test the real traditional Russian blini. 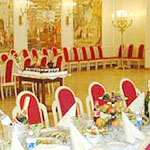 The Grand Banquet Hall "Moscowsky" and smaller banquet halls of the hotel Moscow suit perfectly for all special events. 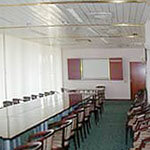 The Hotel offers a full range of services for business meetings, negotiations and seminars. The great hall of the restaurant can be easily turned into a concert hall for 700 people to carry out concerts with famous performers in various genres. 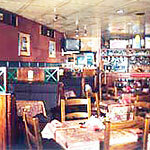 One can quickly convert the restaurant to hold seminars, symposiums and conferences.